For nearly five decades, the Littleton Industrial Development Corporation has guided the regional economy. When the backbone of that economy crumbled during the mid-20th century, a few dedicated business leaders looked for a way to bring the community back to prosperity. 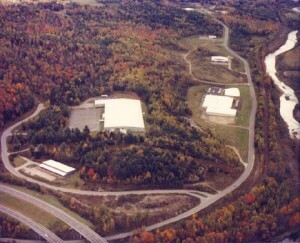 They formed LIDC, which in the 1970s purchased a parcel of land in the first step of many toward creating the Littleton Industrial Park, which has become a robust economic engine in the Littleton region. Today, there are 18 diverse businesses in the Park, employing some 1,200 area residents and contributing to an annual payroll of $60 million. LIDC continues to seek and develop economic opportunity for the community through its ongoing work in the Industrial Park, helping to create the Paul J. McGoldrick Learning Center, working to develop the River District near downtown, and maintaining partnerships with other organizations to foster economic growth. Like most good ideas, LIDC started with a seed and a glimmer of hope. Like most success stories, it has persisted through hard work and collaboration. Here is the story of how it all began – and how far we’ve come! For much of the 20th Century, Littleton’s economy depended largely on the shoe factories lining the Ammonoosuc River. Employment rates at the factories fluctuated wildly, and town leaders began working to develop more diverse economic opportunities in the 1950s and ’60s. 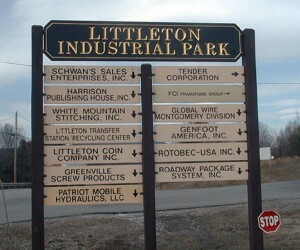 The Littleton Industrial Development Corporation formed in the 1960s and became an integral entity in this endeavor. The volunteer board of LIDC will continue its efforts to make Littleton an attractive place to do business – whether that means running a high-tech office, managing a warehouse, or cultivating a boutique retail shop. In this endeavor, LIDC maintains partnerships with the River District, Grafton Regional Development Corporation, North Country Council, and Northern Community Investment Corporation. LIDC has also developed a Southern Coos-Littleton Area Partnership to enhance opportunities for small businesses in the region. Additionally, plans are proceeding to further develop the Industrial Park and establish additional businesses and employment opportunities.